SAFE consortium is preparing a document of comments/revisions for the EFSA guidance on food ingredients or substances with known allergenic potential. All SAFE members are invited to co-author this SAFE document. 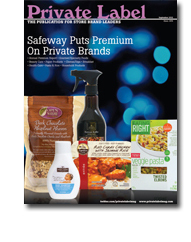 is one of the featured Whitepapers on the New Food Magazine website. See it here. The Release of the Vision Document on 4 June 2013 was covered by FoodProductionDaily.com. The article includes an interview with the Chair of the SAFE consortium Executive Board, Begoña Pérez Villarreal. Read the article here. READ The SAFE consortium Strategic Vision Document, "Keeping Food Safety on the Agenda"
Keeping Food Safety on the Agenda. The document was presented in Brussels on 4 June 2013 to an audience of food safety experts from academia, industry, consumer groups, government and policy makers. SAFE members may download the document by logging in as a member, going to Past Events, and to the AGM 2013 article. *Commission publishes European test results on horse DNA and Phenylbutazone: no food safety issues but tougher penalties to apply in the future to fraudulent labeling. Continue reading for article summaries and links to full text. *Horse meat scandal : Where it began and where are we now? *Novel food ingredients: synthetic zeaxanthin and the extension of use of chia seeds (in baked products, breakfast cereals and fruit, nut and seed mixes). Continue reading for more information and links to the full stories. The SAFE consortium will shift its focus to a vision of future developments in food safety. A strategic VISION DOCUMENT co-authored by SAFE members will be introduced at a SAFE event in early June 2013. Its aim will be no less than putting food safety on the agenda in Europe. Yearly SAFE events will follow, each the venue for the introduction of updated policy- or theme-oriented food safety papers. The goal is to provide substance for European and national policy making and to build a platform to advocate food safety. This position paper is the outcome of a workshop of the same name in the SAFE Consortium Food Safety Seminar Series which took place 5 and 6 November 2012 in Brussels Belgium. EU claims list comes into force. Mobile device enables easier food allergen testing. Scientists urge food safety professionals not to dismiss social media. Acrylamide: A scandal in the making. EFSA provides an update on “Schmallenberg” virus in EU. Anti-microbial air treatment will become ‘important’ hygiene factor - Ecolab. Scientists developing anti-counterfeit milk powder source test. EFSA@10: Ready for the Challenges of Tomorrow. Danish plan for the reduction of the use of antimicrobials. This position paper is based on a seminar in the SAFE consortium Food Safety Seminar Series Update on Microbial Safety of Fresh Produce' which took place on 15 and 16 March 2012 in Bucharest Romania.The seminar was organised by SAFE member IBA together with the SAFE office. EFSA advisory forum: "European food safety has made resounding progress"
The Research Council of Norway has granted 27 mill NOK (3.4 mill euro) for establishing Campus Ås as a National centre for Food Science and Product Development with modern pilot plant facilities for food production, packaging and storage. The new facilities are expected to be ready in late 2012 or early 2013. Existing pilot plants will be upgraded and a unique new pilot plant for processing of foods contaminated with pathogenic microorganisms will be established. This pathogen pilot plant, at Biosafety level III, will be available for international cooperation among R&D institutions, universities and industry. Additionally, the organisers are looking for input from the food sector on activities and/or research that can take place here. Read the full article, including contact information, here.